Frybread is a tribulation food, like matzoh, or chicken chow mein. 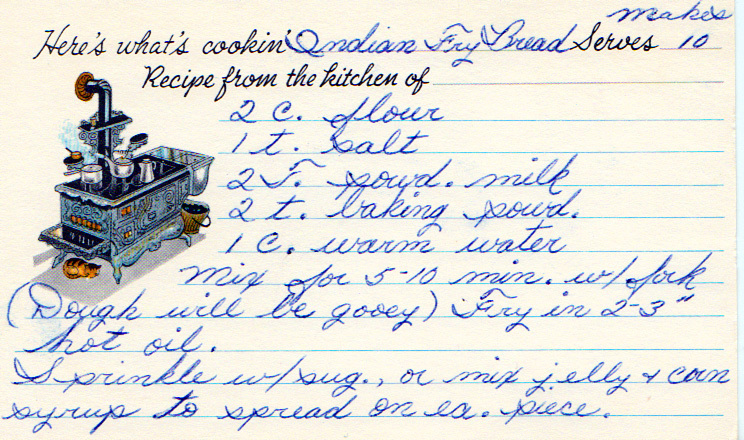 Frybread as we think of it generally dates to 1864 and the forced relocation of the Navajo to New Mexico. The climate didn’t support the same kind of agriculture, so rations, including sugar, flour, lard, water and salt were given to the relocated. There aren’t exactly a ton of ways to combine those ingredients into food. The parallels to matzoh are pretty obvious–a food with a form dictated by necessity that has become a symbol of endurance and adaptability. The parallel to chow mein and the entirety of American-Chinese cuisine probably takes a little more thinking through, but these are also dishes with forms dictated by the availability of ingredients. Tribulation food, I’d argue, is a subset of diaspora food, where techniques taken from one region are, by necessity, applied to different ingredients or in different ways. This is happening all the time, whether we’re aware of it or not. If you’re in the DC region, the injera you get at most Ethiopian or Eritrean restaurants is actually a mixture of the traditional teff flour with the less traditional buckwheat, because evidently, something about our water (too filtered) or our teff (too refined) won’t recreate the overall experience of injera as it would normally be recognized in Northeast Africa. But back to frybread. While Navajo frybread is what we typically think of when we think of frybread, other tribes subjected to similar treatment came out with their own frybreads. Cherokee frybread typically uses some amount of whole wheat flour, I’m told; I haven’t had the chance to try it. Fry in 2-3″ hot oil. Sprinkle w/ sug., or mix jelly + corn syrup to spread on ea. piece.